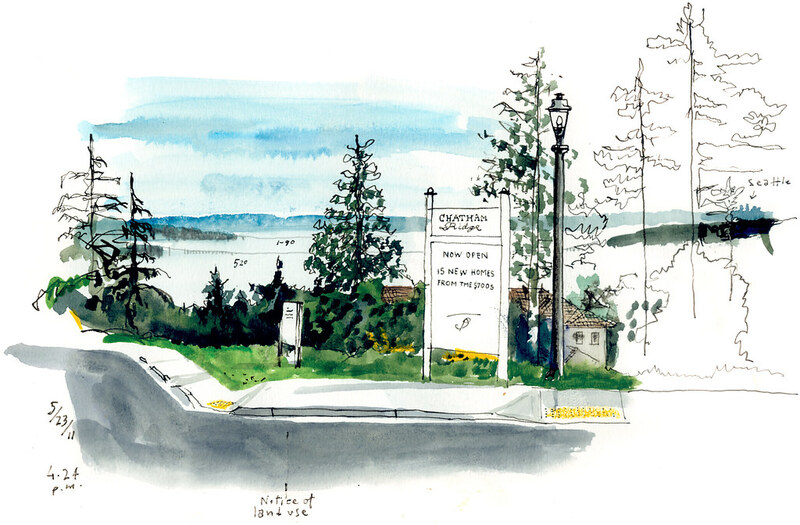 My once-a-month exploration of different communities in the Seattle area took me to Finn Hill this week (See previous dispatches from White Center, Beacon Hill and Shoreline). This quiet and largely residential neighborhood on the northeast side of Lake Washington will officially become part of Kirkland on June 1st. Even though I found a few pockets of new development here and there –like the one pictured in my sketch–, nature seems to be winning the battle with urbanization here. Lou Berner, a local biologist and board member of the Denny Creek Neighborhood Alliance, said the area including St. Edward State Park, O.O. Denny Park, Big Finn Hill Park and the Juanita Woodlands is the greenest space on Lake Washington. I’ll be showing you more of that green in the nexts posts. Stay tuned!